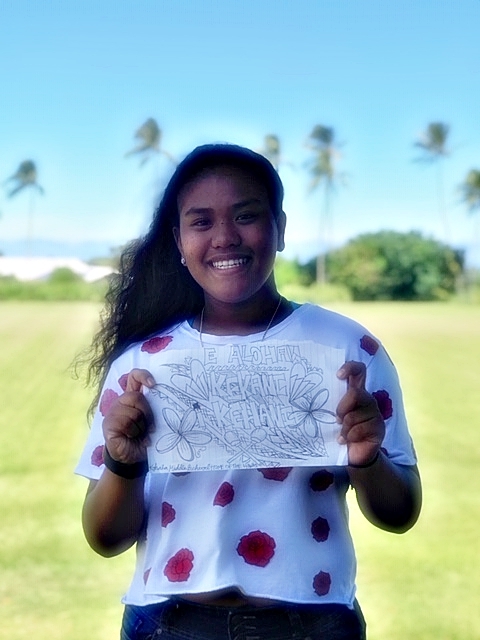 Jayline Salvador and her mural design for Kohala Middle School, Feb. 6, 2019. Courtesy photo. 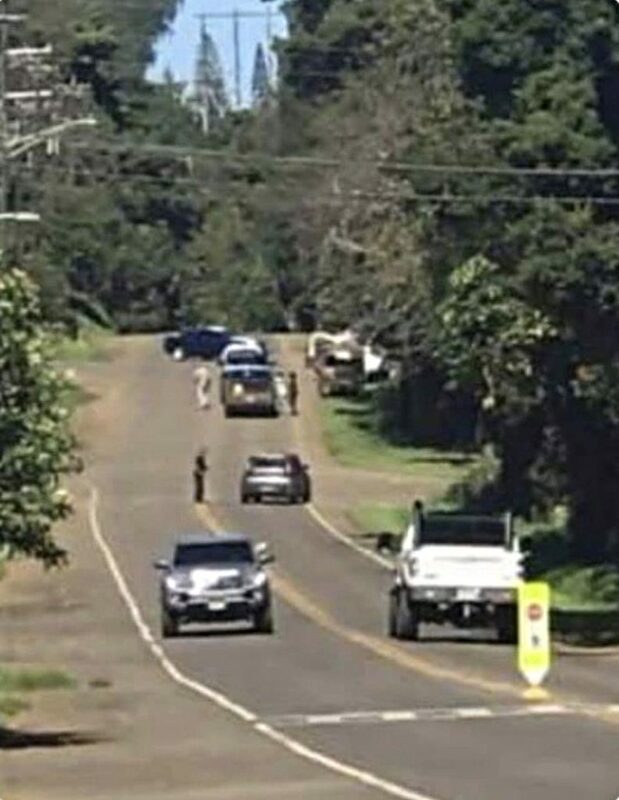 Students in Lauren Canton’s Peer Mediation class initiated the idea to create a “kindness mural” on the Kohala Middle School campus in Kapa‘au, according to a Feb. 6, 2019, press release from the school. 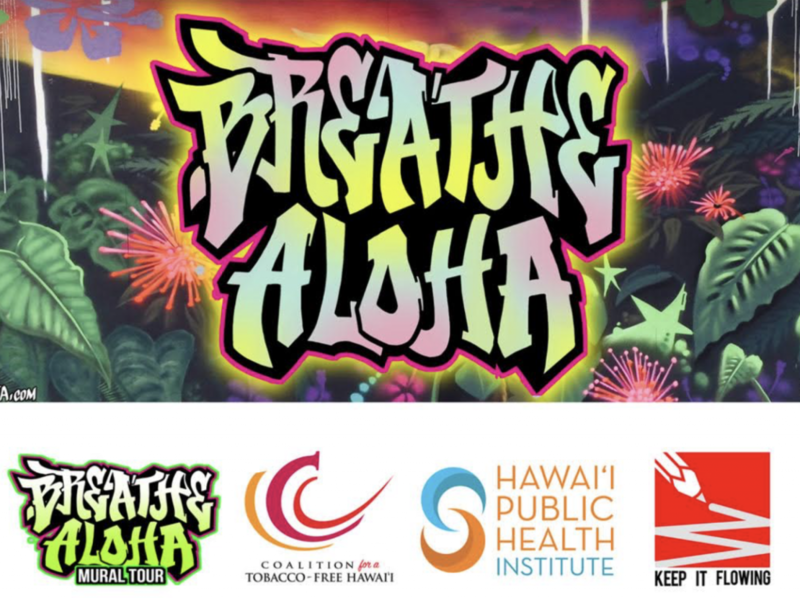 Adrianna Leitch, an eighth grader at the school, came up with the idea to create a mural and her group members joined her in the endeavor, including classmates Naomi Brooke and Megan Ho‘opai, and sixth graders Isaac Salvador-Libron and Aisha Elmer. 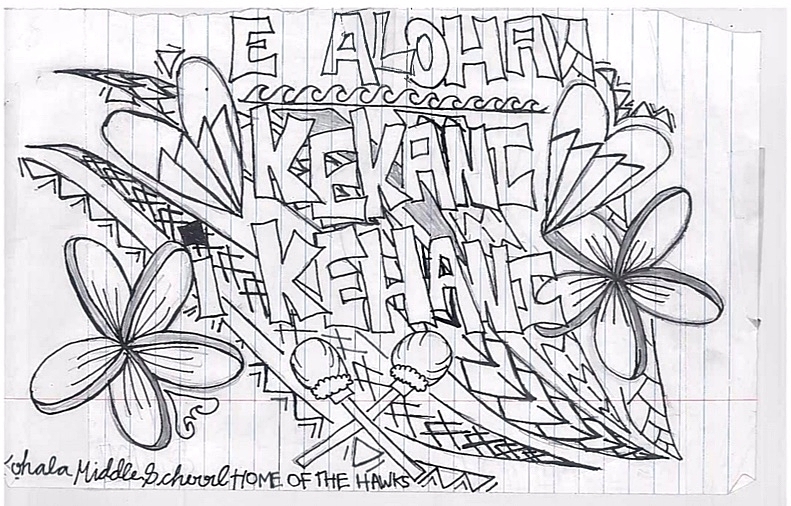 Jayline Salvador’s original mural design for Kohala Middle School, Feb. 6, 2019. Courtesy photo. “I wanted to do something different from everyone else and something that would last a long time,” said Leitch. Peer Mediation students then voted on the winners. Third place design winner was sixth-grader Aisha Elmer, second place was awarded to seventh-grader Lulia Perez, and the first place mural design winner was seventh-grader Jayline Salvador. Salvador’s design is the mural seen today at the school. Averie Sasaki, Raven Diaz and Mahea Pasco work on a mural for Kohala Middle School, Feb. 6, 2019. Courtesy photo. The next step in the process was finding a local artist to help the students produce the mural. 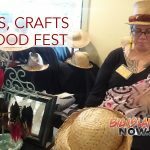 Canton reached out to Anna Flint, co-director of the new Artist’s Cooperative and Community Center in Kapa‘au, who referred her to Raven Diaz, who was instrumental in the production of the mural. 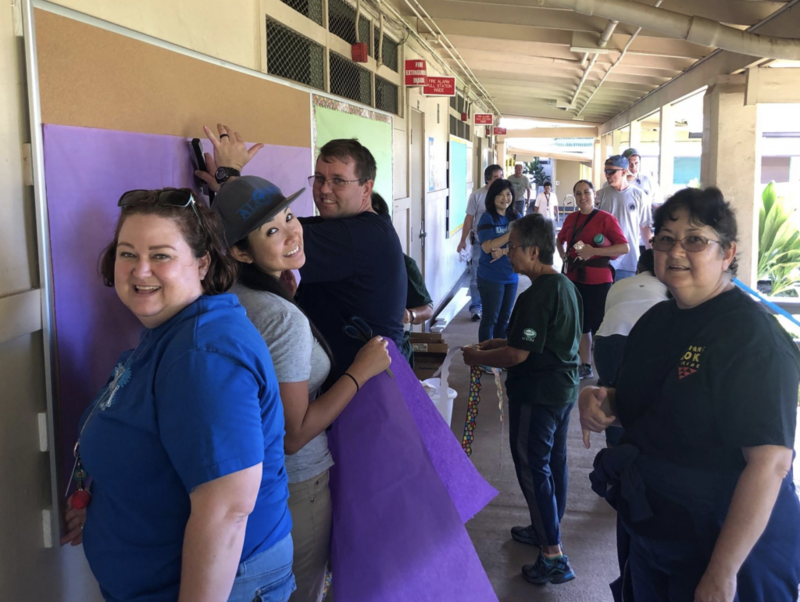 Kalia Riveira helps with the creation of a mural for Kohala Middle School, Feb. 6, 2019. Courtesy photo. “Her hard work, dedication and leadership helped the mural turn out to be a beautiful success,” said Canton. 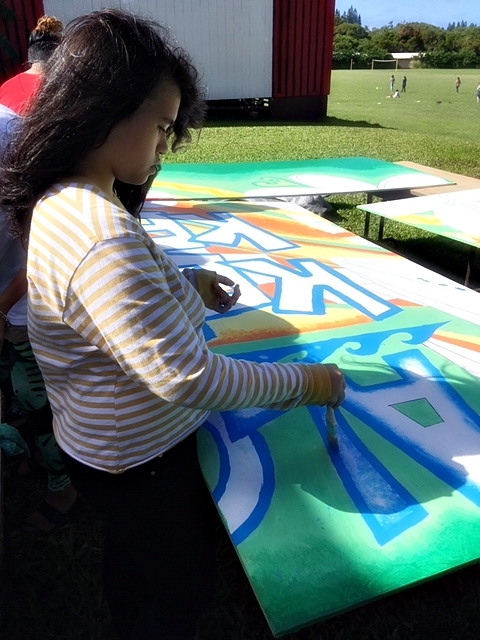 Diaz and the students spent hours planning, tracing, painting and coating the mural. After several weeks, the mural was completed and ready to be hung. 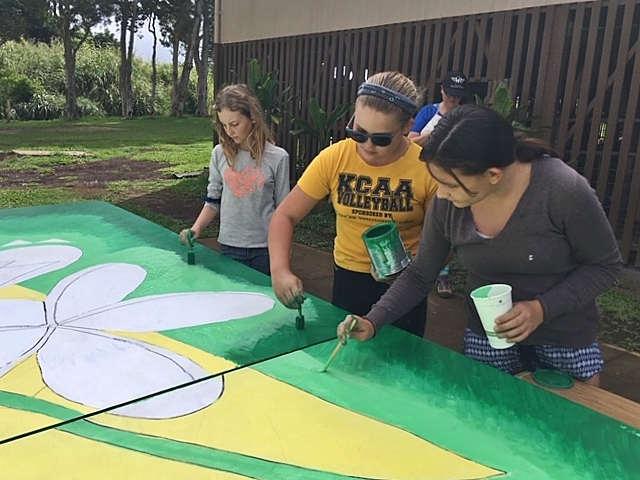 Aisha Elmer, Naomi Brooke and Adrianna Leitch create a mural for Kohala Middle School, Feb. 6, 2019. Courtesy photo. 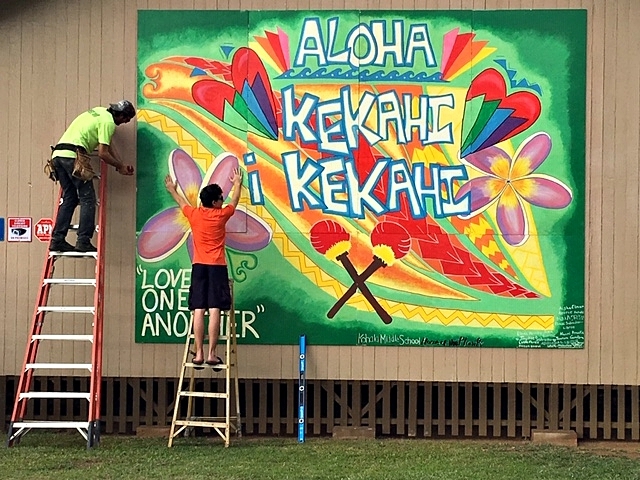 Llosh Winne and Kalei Webster helped hang the mural on the east (Pololu) side of the KMS campus, facing the street. 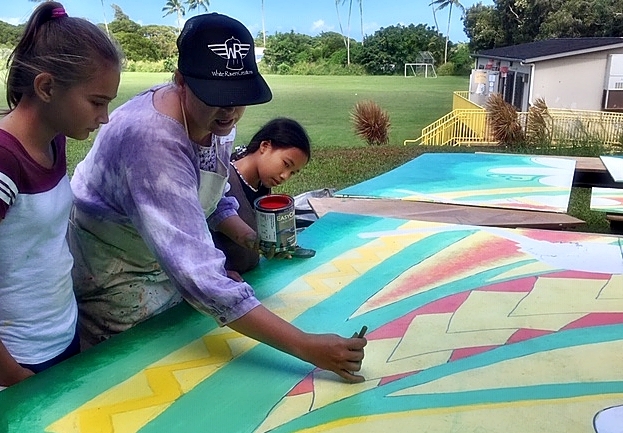 Llosh Winne and Kalei Webster work on a mural for Kohala Middle School, Feb. 6, 2019. Courtesy photo. 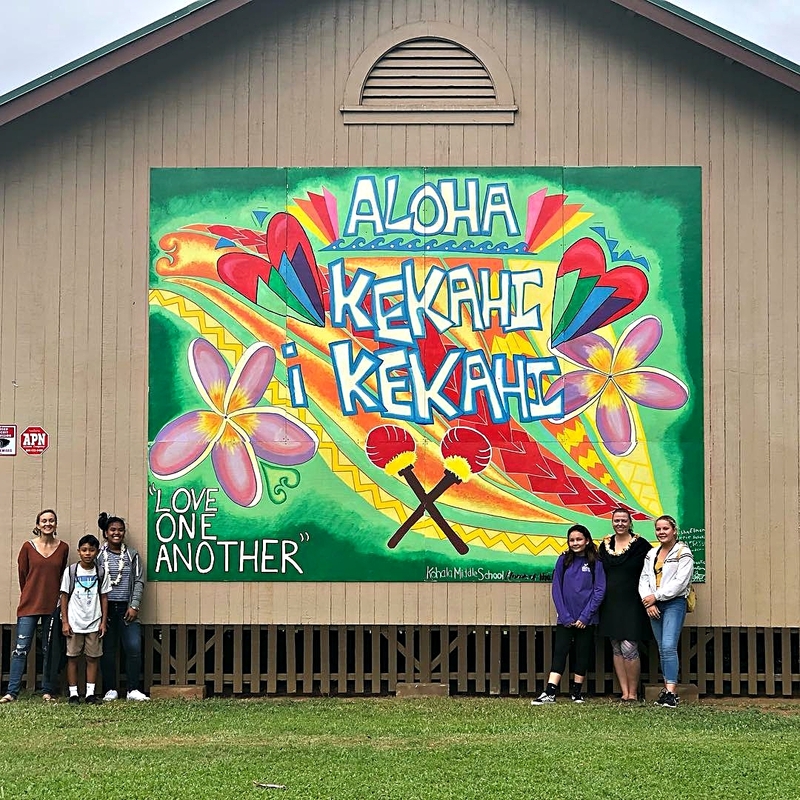 Lauren Canton, Isaac Salvador-Libron, Jayline Salvador, Adrianna Leitch, Raven Diaz and Naomi Brooke pose by the mural they helped create for Kohala Middle School, Feb. 6, 2019. Courtesy photo. 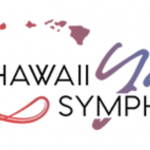 Kohala Middle School is located at 534155 Akoni Pule Highway.